Chicago's Near West Side was and is the city's most famous Italian enclave, earning it the title of "Little Italy." Italian immigrants came to Chicago as early as the 1850s, before the massive waves of immigration from 1874 to 1920. 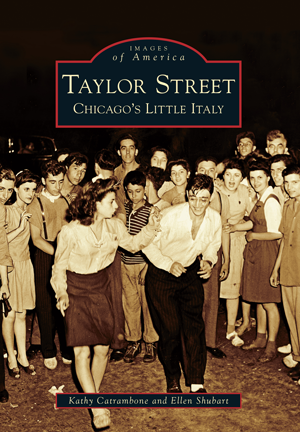 They settled in small pockets throughout the city, but ultimately the heaviest concentration was on or near Taylor Street, the main street of Chicago's Little Italy. At one point a third of all Chicago's Italian immigrants lived in the neighborhood. Some of their descendents remain, and although many have moved to the suburbs, their familial and emotional ties to the neighborhood cannot be broken. Taylor Street: Chicago's Little Italy is a pictorial history from the late 19th century and early 20th century, from when Jane Addams and Mother Cabrini guided the Italians on the road to Americanization, through the area's vibrant decades, and to its sad story of urban renewal in the 1960s and its rebirth 25 years later. Kathy Catrambone, a journalist and second-generation Italian American, traces her roots to the West Side and Taylor Street starting in the early 1900s. She and some relatives still live there. Ellen Shubart is a historian and author. She loves Italian food and frequents Taylor Street often.